Selling a house in NYC can be a daunting prospect. Where does one start? We’ll teach you in this comprehensive primer how to sell your house in New York City without breaking a sweat. We’ll take you from an initial analysis of whether you should actually sell your house all the way through to closing day. Skip to any section via our table of contents listed below! Should I Sell My House in NYC? How Can I Sell My House Fast in NYC? Before rushing to sell your house fast, take a moment to reconsider your reasons for selling a house in NYC. New York City has long been the nation’s greatest and most valuable real estate market. With the foresight of great mayors like Bloomberg and Giuliani, New York City has truly branded itself as a global destination for jobs and capital. As a result, NYC has seen dramatic rises in property values over the past few decades which is not expected to abate anytime soon. So why do you want to sell and miss out on owning a piece of the Big Apple? Common reasons for wanting to sell a house in NYC are job changes or needing more room for a growing family. Perhaps that starter apartment is starting to look small with a second child on the way. Often times, working New Yorkers will not have enough capital or borrowing capacity with their mortgage broker or bank to own two homes at the same time. Very often, a family may not necessarily wish to sell their own house, but they need to in order to be able to buy a new home in NYC. If you are relocating within the city and can save up enough for a down payment to buy a house in NYC without selling your old home, then you should definitely consider this route. Not only will you save on closing related NYC real estate taxes, you’ll also receive all of the tax benefits of being a property investor such as being able to take a paper loss via depreciation. Plus, all of your business expenses and taxes for the investment property will be tax deductible against your investment property income. Pro Tip: Move out and get a signed lease on your existing house first. Perhaps you can move in with your family for a few months while searching to buy a house in NYC to move into. When you apply for a mortgage, your bank may consider your lease income on your existing home for debt-to-income (DTI) ratios. This may negate the effect of you already having a mortgage on your existing home. Selling a house in NYC may make complete sense if you are moving out of the city and you don’t plan on playing property manager remotely. Nothing can be more annoying than receiving a call from a whiny tenant late at night about a clogged drain. Tenants can be especially troublesome if you are selling a house in NYC vs selling an apartment in NYC. Condo and co op apartment owners are only responsible for the interiors of their units, and they can rely on a building superintendent to help as a handyman. Not so if you own a house or multi-family property in NYC. You’ll be responsible for the entire building, so if a boiler starts leaking or the roof gets cracked, it’ll be entirely on you. Do you have the expertise, time and money to handle such issues? If not, selling a house in NYC may indeed be the best option. The cost of selling a house in NYC can stop many a home owner cold in their tracks. They probably didn’t think too much about the typical real estate commission in NYC when they originally purchased, because buyers never have to pay broker commissions. In fact, as the original buyers of their property they probably didn’t even bother to think about who pays for a Realtor when you buy a house. Unfortunately for home owners in NYC, real estate broker commissions are usually the single largest closing cost they will face at 6% of the sale price. However, home sellers can save on their NYC closing costs through an Agent Assisted FSBO listing if they have time to show their own homes, or a 1% for Full Service listing if they are too busy to show their own homes. Other major closing costs for sellers in NYC include the NY State and NYC transfer taxes which can add up to almost 2% of the sale price. A real estate attorney will be required as well to help you negotiate and review the purchase contract with the buyer’s attorney. An attorney will set you back $2,000 to $3,000 on average. Make sure you work with an attorney who specializes in real estate transactions. A good sign that an attorney doesn’t specialize in real estate is if they attempt to charge you by the hour. Good real estate lawyers will take a flat fee and take it at closing. Read our questions to ask your real estate attorney before you hire them! Your real estate attorney will give you a detailed spreadsheet before closing of your exact closing costs. This spreadsheet is commonly referred to as a real estate closing statement in NYC. All other closing costs in NYC will be relatively minor compared to broker commissions and transfer taxes if you’re selling a house in NYC. If your house is in extremely poor condition, then please read our article on whether you should renovate before you sell in NYC. However, you should generally attempt to sell your property as is. Not only can renovations take longer than you expect, they usually run over budget unless you are a general contractor yourself. Furthermore, what if your over budget renovations aren’t what buyers are looking for in the first place? What a waste it will be if the first thing a buyer does is to renovate the house again because it wasn’t to their liking! With that said, there are minor touch-ups you can make without doing full scale renovations. For example, peeling paint and scratches on the walls are easy to fix with a new coat of paint. Scratched up floors can be re-sanded. These are all things you can do without having to hire a general contractor for a major renovation job. Lastly, do your best to make your house presentable for buyers by reading our apartment decluttering secrets for 2018. Make your apartment as uncluttered and spacious as possible so buyers can imagine a new life in your house. The last thing you’ll want is for your old life to be all they see. Here are a few time tested tips for how to get your house ready to sell and in showing condition. Seriously, this means no piles of paper, pens, gadgets, glasses, detergents, dishes, shoes, clothes, fridge magnets, toys and other eyesores. All rooms including the bathroom should be meticulously decluttered. It’s easy yet super important to clean all of your countertops when selling a house in NYC. Try to use a natural cleaning spray and thorough wipe clean your kitchen and bathroom counter tops. You should obviously declutter your counter tops as well. That means no rags, pots, remote controls, keys, newspapers, magazines and glasses lying around. It is also important to tidy up all countertops. Therefore, remove all rags, washing-up brushers, pots, remote controls, newspapers and the like. This is an easy thing to forget when selling a house in NYC. Make all of the beds in your house. Not only will this look neat for buyers, they’ll be more likely to think that you’re a tidy person in general and that the house is in a better condition. Avoid seasonal ornaments such as Christmas or Kwanza decorations. Especially if you are prepping your home for professional photographs, the last thing you’ll want is for today’s whiny buyers to complain that you’re being discriminatory in some manner, or that you’re steering your property towards a certain subset of buyers. Before a property showing, turn on all of the lights in your home. This includes candles and fireplaces if you can light them in time. Not only will this create a unique mood in person, it’ll be great for ambiance if you’re prepping your house before a professional photoshoot. If your property gets great natural sunlight, then make sure to open all of the curtains and pull up all of the blinds before a showing. Create space in your house if you have lots of furniture and other items laying around. Consider removing some of them and putting them in storage. If you have many jackets hanging from overloaded coat hooks, consider putting them in the closet instead. This should be relatively easily to do. Remove any garden tools or hoses laying around. Remember to mow your grass and rake away any fallen leaves. You should strive to present your home in the best light, whether it be for a property showing or for professional photographs. Think about all of the small touches that high end hotels will do. That means hanging up fresh towels, putting new flowers into your vases, having a small plate of chocolates out etc. Pro Tip: Dust is not visible in images, so you don’t need to go overboard in advance of a professional photo-shoot. The best way to sell your house fast is to slightly under price your property vs comparable properties on the market. The real estate market is extremely transparent today, and especially so in New York City with popular property search portals that accumulate all manner of information on buildings in the city. As a result, it’ll be very apparent to buyers if your property is fairly or slightly under-priced, and doing so will cause buyers to fight over your property. On the contrary, if you price your property too high or optimistically, people are not going to be fooled or tricked into buying an overpriced property. You’ll hear crickets if you list your property too high, and your listing will start to look like a bad apple as it sits for months on the market. Keep in mind that your initial listing price is not the maximum price you can sell your house for. If your house is under priced, you’re likely to get best and final offers in a bidding war and sell above your asking price. Furthermore, by saving money on broker commissions through Hauseit, you’ll be able to undercut competing NYC properties for sale and attract a greater share of buyer traffic. So not only will you save money on Realtor commissions, you’ll also be able to sell faster and receive more buyer attention through Hauseit! Lastly, don’t fall for any of the scams that try to get you to sell your house now. Unfortunately, there are even some well-funded startups that amount to this sort of scam. Just remember that the only person who benefits in an off market transaction is the buyer. The whole business model of these “we buy houses all cash now” scams is to purchase properties off market from desperate sellers at below market value. If you properly marketed your home to all possible buyers through the REBNY RLS or Manhattan MLS and associated consumer search websites, these scam artists wouldn’t stick around. Why? Because they don’t want to pay fair market value for your house. Pro Tip: Read our guide on how to set your FSBO listing price in NYC to determine your optimal listing price. Selling a house by owner can be tricky in NYC if you don’t have the right marketing exposure. If you sell your house yourself through a traditional For Sale By Owner listing, you’ll miss out on the 90% of buyers who are represented by buyers’ agents. So how can you sell your own house without having to pay a traditional Realtor 6% in commission? Fortunately, home sellers today can have the best of both worlds through Hauseit. You can still sell your own house yet have the full marketing exposure of a traditional agent marketed listing through an Agent Assisted FSBO, otherwise known as a flat fee MLS listing in NYC. 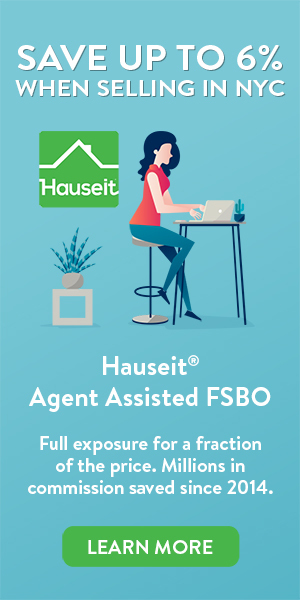 Through an Agent Assisted FSBO, your property is listed by one of our traditional, brand name broker partners and your listing is mixed in with their full commission listings. Buyers’ agents can only see the commission you’ve offered them on the REBNY RLS, not the total commission structure. As a result, no one will know that you’re not paying full commission! And because your listing blends in and looks like a traditional listing, you’ll avoid the annoying harassment and solicitation that FSBO sellers traditionally face. Best of all, your house will be listed on the relevant, local broker database for your region. We offer the REBNY RLS, the Hudson Gateway MLS as well as the Long Island MLS. Collectively, these three MLS systems cover all of the NYC metro area, the Greater Hudson Valley and all of Long Island. We’ve got you covered! Most sellers in New York end up marketing and selling a house as is. Selling a house as is means the seller will not be making any repairs or renovations for the buyer as a condition of the sale. Furthermore, New York law is quite favorable towards sellers in this regard and homes are sold under the principle of caveat emptor, which is Latin for buyer beware. This means that instead of a signed property disclosure form as you might see in other states, the seller will usually give the home buyer a standard $500 closing credit instead. The rationale for this is that sellers are not engineers and cannot be expected to analyze the condition of their property for hidden defects and other issues. Furthermore, due to the high demand for NYC properties, sellers can usually get away with selling a house as is. There are usually too many interested buyers for one party to be able to demand extra work from the seller before close. If a buyer was delusional enough to demand this, the seller would typically just sell to someone else with less stringent closing requirements. Keep in mind that in a slow market where the seller only has one potential buyer and offer on hand, the seller may actually agree to make repairs and fix certain items as a condition of closing. As with all things in NYC real estate, it’s negotiable! After you’ve thought long and hard about whether selling a house in NYC makes sense, analyzed whether the costs of selling a house in NYC are acceptable, decluttered your home and prepped it for showing condition, it’s time time to learn what the step by step process of selling a house in NYC involves. We’ll give you an overview in the following sections of each step of the process of selling a house in NYC, from initially marketing your home through to who to expect to see on closing day. Enjoy the journey and good luck! What’s the best time to sell your house? The most common advice you’ll hear from real estate agents in NYC is that home sellers should initially list their property in early Spring in order to catch the Spring, Summer and Fall selling seasons. This makes a lot of sense for sellers who are about to sign a standard, 6 month Exclusive Right To Sell Listing Agreement! As we’ve just discussed, the last thing you’ll want is for your home to be technically off market as a traditional For Sale By Owner listing. You’ll want to fully expose your house to all potential buyers through an Agent Assisted FSBO. That means listing your home on your local NYC Multiple Listing Service and all relevant property search websites such as the NY Times, StreetEasy, Zillow, Trulia, Brownstoner etc. Once your home is listed, hold as many open houses as possible to maximize in person views and foot traffic. Just remember that the only buyers who will put in an offer are those that have actually seen your house. Don’t make the mistake of being overly cautious with showings. Get as many people in the door as possible! New York is a state that requires by law an attorney to be present for real estate closings. What typically happens is the buyer and seller each have their own attorney representing them on the transaction. It’s important to work with an attorney who specializes in real estate transactions. A general practice lawyer will not be familiar with the many intricacies of real estate deals and the special situations that may come up. Read our list of questions to ask your real estate attorney before you interview and hire them. A good sign that a lawyer is a general practice attorney is when they attempt to charge you by the hour. Real estate focused attorneys all take a flat fee of $2,000 to $3,000 on average at closing. Need an introduction to a seasoned real estate attorney? Contact us today for a referral! Assuming you’ve priced your home correctly, or better yet, slightly under priced your house vs comparable properties for sale in your area, you’ll start to receive multiple offers. At this point, you can hold a best and final offer process to maximize the price of the offer you ultimately accept. Once the shenanigans are over and you’ve accepted an offer, you or your real estate listing agent will circulate a deal sheet to the lawyers and brokers on both sides. Once the lawyers have the deal sheet and are in touch with each other, the seller’s attorney will send a draft purchase contract to the buyer’s attorney for review. The attorneys on both sides will proceed to negotiate the contract with each other on behalf of their respective clients. Once a revised contract has been mutually agreed upon, the buyer’s attorney will summarize and review the changes with the buyer. The buyer will then sign the contract and hand over a check for the contract deposit of typically 10% of the contract purchase price. The buyer’s attorney will then messenger the signed contract and good faith deposit to the seller’s attorney. Upon receipt, the seller’s attorney will get the seller to counter-sign and send back to the buyer’s attorney a fully executed copy of the purchase contract. At this point, your listing is technically in contract and a relatively secure deal is on hand. Pro Tip: Real estate offers are not binding in NYC whether they be made or accepted in writing or orally. That means an offer is not binding for each respective party until they have signed it. Since the seller is the last to act, the seller is not bound even if the buyer has already signed the contract! However, as a professional courtesy most attorneys will push their seller to counter-sign a contract within one or two business days. A buyer will typically request a home inspection when buying free standing property such as a house or a multi-family property in NYC. Many buyers will not make a home inspection a formal contingency, but will rather ask to see it again with their home inspector after an offer has been accepted. This route is typically taken as it makes their offer easier to digest, and offers are not binding anyway until the buyer has signed the contract. As a result, you should expect the buyer to request a home inspection shortly after you’ve accepted their offer. The inspector will want to earn their fee, so a typical home inspection can take two or three hours. The home inspector will look at everything from the roof to the boilers to the windows. Take a look at our sample home inspection report to get an idea of how thorough a typical home inspector will be. A buyer may attempt to renegotiate the price, or ask you to make repairs after seeing the results of the home inspection but before they have signed the contract. Your lawyer will negotiate this on your behalf, and it’s up to you to gauge how credible their threat to walk away is. As we’ve previously discussed, most sellers will decline any requests to make repairs as a condition of closing as most properties are sold as is in New York. So if you have enough demand from other buyers, feel free to tell the buyer to take a hike! Assuming the buyer is financing the purchase with a mortgage, their bank will order a property appraisal on their behalf. Appraisals usually aren’t an issue for either party as the appraised value usually comes in at or near the actual contract price. However, this can be an issue if the appraised value comes in much lower than the contract price. That’s because the mortgage broker or bank will only lend based on the appraised value. That means if the bank was willing to lend at 80% loan-to-value (LTV) on $1 million, but the appraised value comes in at $800,000, the buyer will be in serious trouble. That’s because instead of an $800,000 loan, the buyer will only get a $640,000 loan. That extra $160,000 will have to come from the buyer in the form of additional equity. This can be a serious issue for many buyers who don’t have that kind of additional liquidity on hand. This is also why many buyers’ lawyers will negotiate appraised value or minimum loan amount language into the mortgage contingency clause. If the buyer does have language protecting him in this situation and is able to walk, it becomes a matter of negotiation on desire. The buyer may waive the contingency because he or she wants the property anyway. Or the buyer could threaten to walk away if there isn’t a concession on price. It’s all negotiable! Once the buyer has wrapped up the appraisal and received a mortgage commitment letter, his or her bank will give a clear to close. That will allow the attorneys on both sides to schedule a closing date, time and place. The brokers will schedule a final walk-through inspection on the day of or the day before closing. The final walkthrough is an opportunity for the buyer to inspect the property one more time before closing and to make sure that the condition has not changed since the last viewing. Technically, the condition of the property should not have changed since the date of the contract signing. All of this is hard to prove unless there is evidence in the form of dated photographs and emails. We recommend documenting the condition of your property even if the buyer does not so you will have evidence on hand if the buyer complains the day before closing about something that should be fixed. Pro Tip: Remember that appliances are typically mandated to be in working condition in purchase contract language; however, that does not mean they need to be new. Congratulations on selling a house in NYC, you’ve made it! Closing day is typically less stressful than the previous steps because all of the kinks and negotiations have been worked out. It’s rare to see further negotiations at the closing table. However, you should make sure your attorney is there vs his paralegal in case there are sneaky last minute negotiations. You’ll want your senior lawyer to be there to handle any shenanigans by the buyer’s attorney last minute. The closing will typically be held at the seller’s attorney’s office, or another location more centrally located in NYC if the seller’s attorney’s office is far out in the boroughs. Expect to see on closing day the buyer’s attorney, the buyer, the buyer’s bank’s attorney, the seller’s attorney, the seller and a closing coordinator or representative from the title company. The brokers will usually not be present at closing as they do not have a role to play. They may show up at the end to congratulate their clients and pick up their commission checks, but otherwise it would only be for moral support. Have more questions? Ask us anything in the Hauseit Forum – Where New Yorker Real Estate Professionals Come Together to Talk Real Estate!